The Breville Variable Speed Blender – With 600 watts of power and brushed stainless steel good looks, making your favorite beverages is fast, simple, and beautiful. 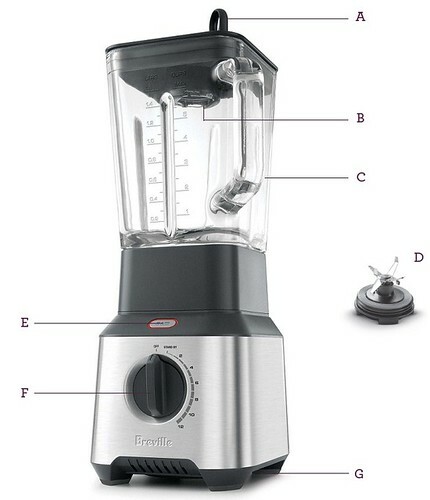 Specially designed for efficient use, this blender’s innovative 6-way blade crushes ice for cocktails in seconds. Rediscover shakes, smoothies, or what ever your imagination can master up with the 12 variable speeds. A. Breville Assist Lid™. B. Inner Lid/Measuring Cup. C. 54 oz. Glass Jug. D. Blade Assembly. E. Illuminating 'PULSE/ICE CRUSH' Button. F. 12 Setting Variable Speed Control. G. Cord Storage. Not Shown Breville Assist Plug™.